During a recent stay in the hospital for a total shoulder replacement, I boarded my dog Brooklyn at her favorite dog daycare. The next morning, after bringing her back home, I resumed the schedule of walking her each morning and evening. But, I couldn't reach my phone/palm computer in my pants pocket. First, I put my phone in my other pocket, but it had to share space with the stuff in that pocket. Later, I simply stuffed my phone in between the sling and my arm. Not bad, but I worried about it falling out. I then remembered that I had an unused pouch - I added velcro to the back. It stuck easily to the outside of the sling and worked well as a carry-all. Then I realized I could also attach a cup holder to the flat top of the pillow on the inside of the sling. This had possibilities. I further explored and determined carrying needs and solutions. The prototype items worked great - functional, not too obtrusive, and respectful of the black sling. Cups and bottles in the cup holder were quite secure and the pouch was big enough to hold my phone, energy bars, and snacks. Google searches showed nothing on the market for attaching items to medical slings. I showed my nurse neighbors who loved the idea and saw numerous possibilities. When I showed the Physician Assistant - I was curious if he had seen the idea before - he also loved it and commented that he had never seen such products. Also got positive feedback from Physical Therapists. 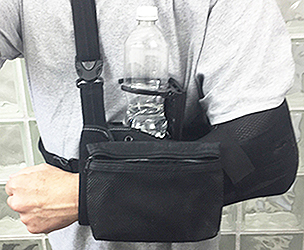 Any combination of Accessories can be velcro attached to the various parts of the arm sling - they help the user to live a more normal and more active life - able to carry items one normally might while hiking, walking the dog, shopping, exercising, going to movies. It's not just a sling - it's a Carry-all! • Pouch/Wallet: to hold smartphone, music player, ear buds, TV remote, snacks, sunglasses. • Hook: caribiner for keys and hanging items. 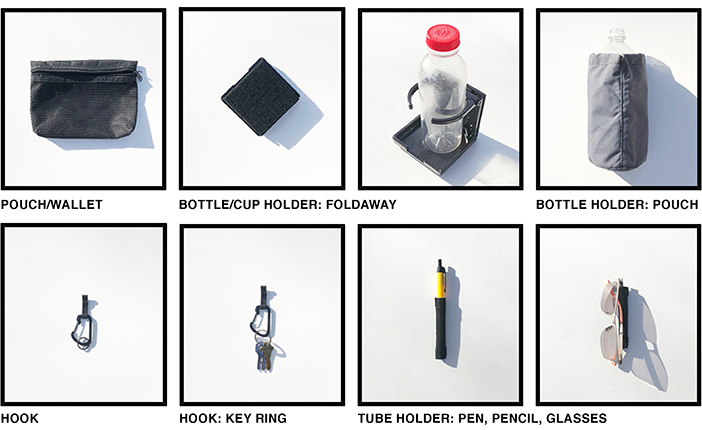 • Tube Holder: for pen, pencil, eyeglasses. Any teen or adult who wears a sling and has a desire or need to conveniently carry items. 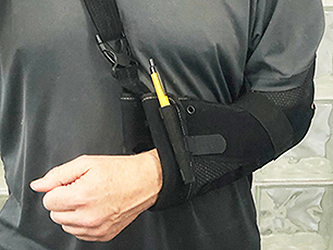 Would likely be ordered online while ordering the sling or offered by Orthopedists, Physicians Assistants, Nurses, Physical Therapists, and Athletic Trainers. • Solid material (not mesh), to provide privacy of stored objects. • Black, to be discrete on black slings and straps. • Lightweight, to not add stress on the neck. • Pouch: minimal bulk, but large enough to hold smartphone. • Easy to access pouch contents, velcro tab (no zippers). • Easy to attach and remove from a sling, using one hand only; tabs of velcro on each accessory. • Secure attachment, to firmly support contents.